Here in Cusco thousands of people gather at the Plaza de Armas on New Year’s Eve. 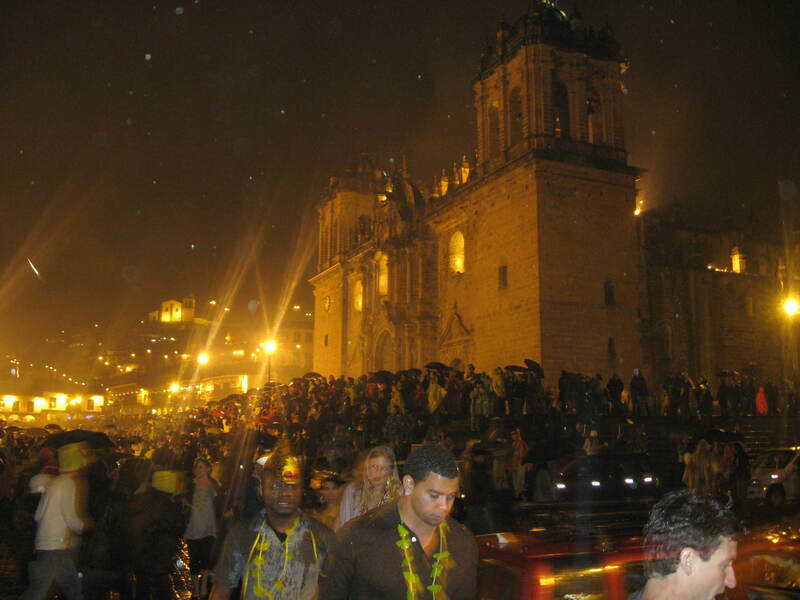 Exactly at midnight the famous Maria Angola bell on the Cusco Cathedral rings in the New Year, and the crowd circles the Plaza de Armas, which is supposed to bring good travels for the next year. New Year’s in Peru is all about YELLOW. Yellow hats, yellow leis and most of all… yellow underwear! 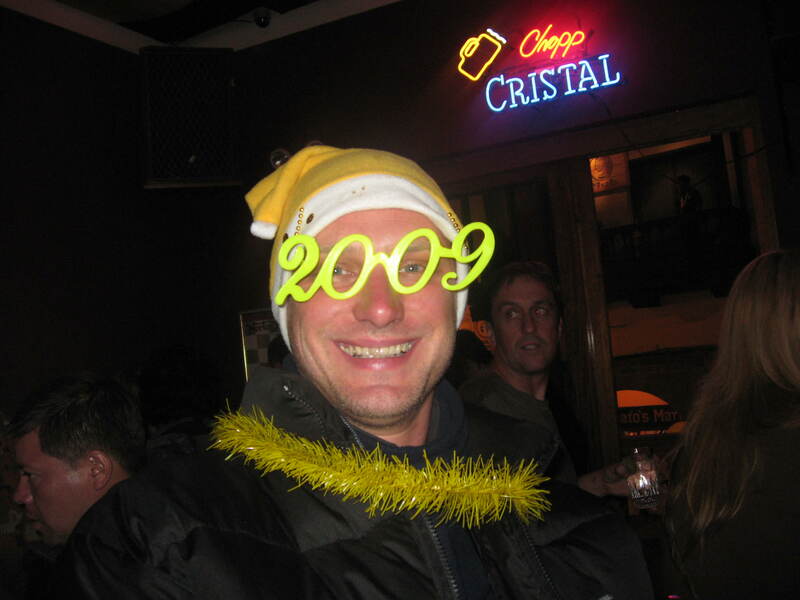 That’s right, one of the traditional beliefs in Peru is that wearing yellow on New Year’s Eve brings good luck for the New Year. Eating 12 grapes at midnight for good luck. Putting some coins in the corners of the house for good fortune. Fireworks are sold legally all over the city, so New Year’s Eve in Cusco is not for the faint of heart. Since we are now well into rain season, it was also raining all night, which didn’t really spoil the fun. Manchita decided to drink her 12 grapes at midnight - JUST KIDDING!!! Despite the rain we had lots of fun. 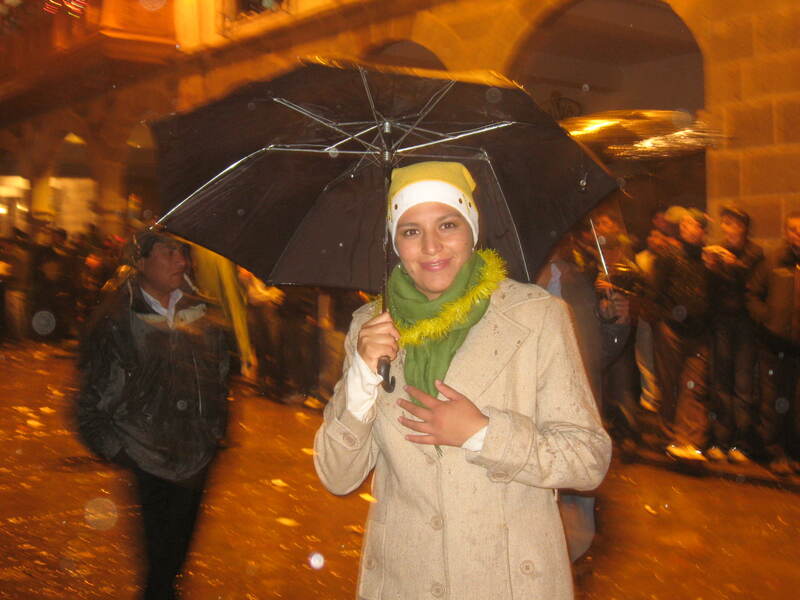 This entry was tagged Año Neuvo, Cusco, Life in Peru, New Year, Peru, Plaza de Armas Cusco. Bookmark the permalink. Love the photo of Manchita in her yellow party necklace. 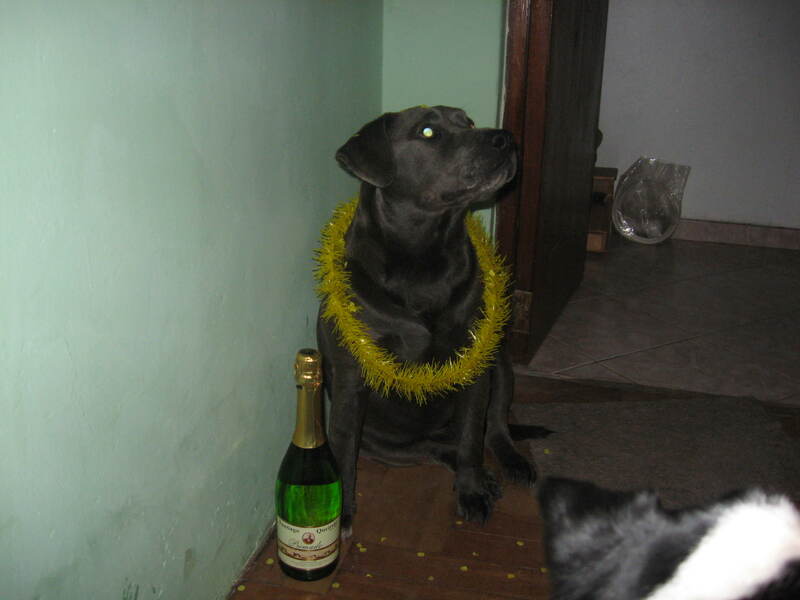 Lola sends her a big New Year’s woof hello! The “Maria Angola” was built in 1655, weighs about 6 tons and is 2.10 meters high (about 7 feet). It is said the bell can be heard up to 30 kms. (nearly 20 miles) from the Cathedral. There is a love story attached to the name and making of the famous bell. At the time there lived a very rich woman in Cusco, named Maria Angola. She became involved in a passionate romance with a Spanish beau, by whom she became pregnant. On hearing of this, Maria Angola’s father challenged the seducer to a duel, but the father died in the field of honor. The Spanish man then traveled to Spain, promising to return, but he died during the journey. Maria Angola was very sad over the loss of both her father and lover, and entered to the Convent of Santa Teresa. There, in manifestation of her devotion to the Virgin Mary, she threw all her gold and precious jewelry – which constituted an immense fortune – into the hearth where the bell was being smelted. For this reason the bell was named “Maria Angola”. In the 1954 adventure movie SECRET OF THE INCAS Charlton Heston plays tough gringo (and Indiana Jones lookalike)Harry Steele who is showing tourists around the plaza in Cusco. He wasn’t a very good tour-guide, for he points out the wrong location of the Maria Angola Bell.